The most recent reconstruction of Cheddar man as per DNA analysis. In 1903, the oldest complete human skeleton was found in Gough's Cave in Cheddar, England. The remains were that of a male who had died 10,000 years ago and he was given the epithet of "Cheddar man," based on the location of his remains. For decades now, various reconstructions have been made of the finds and just this month a new reconstruction was revealed based on recent genetic testing. 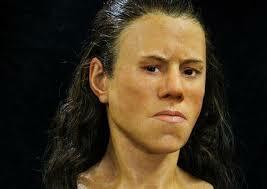 So, what did Cheddar man look like? Well, apparently, he may have had dark skin and blue eyes. On the face of it this is not a particularly startling find as white skin tones are not supposed to have developed until around 5,800 years ago – although in Scandinavia it may have developed early, some 7,700 years ago. However, when it comes to Cheddar man it is not just that he was dark but that, he was "dark to black." It is interesting how he is described as being "dark to black," and problematic, because it leads people to assume the earliest inhabitants of the British Isles would have been sub-Saharan, as in most peoples' minds black refers specifically to sub-Saharans. Referring to Cheddar man as black has only fueled afrocentrists, that is people who believe sub-Saharan blacks once dominated the world, with some going as far as to say that Egypt or even the Olmecs, Chinese and other ancient civilizations were originally black). Of course, these views are not held by all of them, but most do seem to agree that anything dark enough to be considered black is the same as sub-Saharan. We often see from academia the desire to question whiteness, but what is blackness? Given that black has historically been applied to a wide number of genetically unrelated groups whose only commonalities are skin colour and (in many cases) hair type. It is only thanks to American influence that "black" refers today to sub-Saharans and West Africans in particular. If Australia had become global hegemon black would refer to their aborigines, if the Philippines held that position, it would refer to their indigenous peoples (often referred to as negritos – little blacks), and if Brazil had been in America's place then blackness would encompass an even greater variety, as in that country race is seen to be as fluid as gender is by the global liberal elite. Cheddar man being dark does not mean sub-Saharans are the autochthonous inhabitants of Europe. It would seem he shares DNA with modern inhabitants of Britain and other parts of Europe. Maybe those who are so eager to deny race (at least when it comes to Europeans) and deconstruct identity should keep this in mind when it comes to blackness. Or better yet, they could stop engaging in such destructive behavior which ultimately only furthers the growth of the elite powers they so vocally claim to reject. Given not only the description of Cheddar man, but the remarks from the scientists and artists who took part in the recent reconstruction project, I think it is fair to say that there is political aspect behind the current reconstruction project. This includes the usual desire to deconstruct whiteness. Yoan Diekmann, a computational biologist at University College London and another member of the project's team, agreed, saying the connection often drawn between Britishness and whiteness was "not an immutable truth. It has always changed and will change." If white is an evolution of brown, it also means that we are more evolved than Browns, at least in the sense of being better adapted to European climate and habitat. But possibly also in more complex, deeper ways, ways which would deeply upset any egalitarian world view. The idea that peoples from cold climates have a higher group intelligence because the evolutionary pressure to survive and cooperate has been greater in the harsh climate than in the warmer climes is reasonable to contemplate. If the conditions in Europe were so different from the place where the Cheddar man came from that they changed his phenotype within a relatively short span of time, why should his evolution be limited only to one particular characteristic, the pigmentation of his skin, and not to more aspects of his body and mind? Don't hold your breath though that natural scientists will dare to address this obvious question with an open mind anytime soon. The belief in One World requires One Truth, the orthodox, politically correct truth that everybody is "equal." Turning briefly to the Americas, note the leftist double standard in treating distant ancestry. Amerindians clearly descend from Asiatic people. Yet no leftist makes the case that Amerindians owe something to Asiatics, that the pre-Colombian Americas were therefore a "nation of immigrants" and that — Heaven forbid! — the definition of a "native" to Canada is not an immutable truth but bound to change over time. No multiculturalist would ever argue this way because then he would have to concede that the European founding peoples of Canada have to be considered "First nations" too — and gone out of the window the carefully crafted special status of Amerindians would be. The artists, Alfons and Adrie Kennis, made Cheddar man's skin as dark as possible as if to make him as superficially distinct from modern inhabitants of the British Isles as possible. Was that necessary? 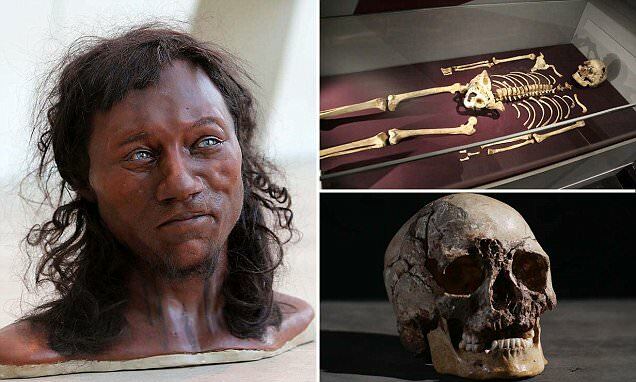 When several years ago evidence from a Spanish find revealed (from roughly the same era: the Spaniard being 7,000 years old) that the man in question also had dark skin and blue eyes there was no such rush to make him look as dark as the recent depiction of Cheddar man. Yes, there is a 3,000 or so year gap between the two men, as stated earlier outside of Scandinavia, light skin was not yet existent in Europe. In January of this year, a far less celebrated reconstruction of a find out of Greece (a young woman, "Avgi," who lived 9,000 years ago) was shown to look pretty similar to modern Europeans populations. It seems that as Europe becomes ever more populated by brown immigrants, the images of our ancestors will be darkened ever more by our deceptive academics and scientists in order to justify this invasion of non-Whites. But what the browning of our ancestors shows is that we Whites were a late evolutionary phenomenon, a singular and superior people coming later in the soil of Britain and indigenous to our Europe.